Why Tesla’s Solar Roof Is Just Another Giant Taxpayer Gift To Elon Musk, at zerohedge.com. Elon Musk is skilled at getting his hands on taxpayer money. He is nothing more than a welfare recipient. If a business isn’t profitable without taxpayer money, it shouldn’t exist. Taxpayer money shouldn’t be given to any businesses. The Minimum Wage Eats Restaurants, at econoicpolicyjournal.com. As the minimum wage rises via government decree. Restaurants close. If these restaurant owners were as talented as Elon Musk, they would get taxpayer dollars from government to pay for the mandated minimum wage increase. On The AFL-CIO’s Inflated 341-to-1 CEO-To-Worker Pay Ratio, And The Statistical Legerdemain Used To Produce It, by Mark J. Perry, at carpediemblog. When ‘fake stats’ are never analyzed they produce ‘fake news’. The media accepts ‘fake stats’ as long as they fit the media’s vision of the world. Trade Ignorance and Demagoguery, by Walter E. Williams, at jewishworldreview.com. I wish Trump would sit down with Dr. Williams for a day and learn something about economics. California, Illinois, and New York Keep Losing People to Other States, by Ryan McMaken, at mises.org. People are voting with their feet. High taxes, increasing regulations and the high cost of living are incentives that force people to escape to greener pastures. The Most Dangerous Book On Economics Ever Written For Kids, at economicpolicyjournal.com. The left is propagandizing children into believing capitalism is bad and communism is good. ‘Hero’ Stopped Mass Murder By Crazed Bar Patron Who Was Armed To The Teeth, Police Say, at dallasnews.com. Gunman who killed sports bar manager is shot by concealed carry holder. Good guy with a gun stops a bad guy with gun. 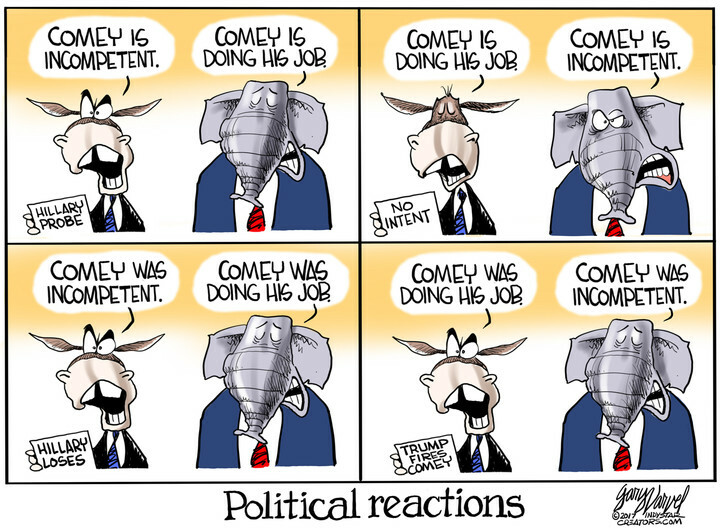 Senate Hearing Summary: Everything you Thought You Knew About Russia/Comey Just Got Destroyed, at zerohedge.com. Does anyone outside of the Washington establishment really think this is important? This is the political game of who can make the other side look bad. The people inside the beltway don’t understand how much people outside the beltway are sickened by the political game. We don’t want to play this game or watch this game played anymore.